Paul Kruger Gate is the closest entry point to Skukuza. There is often good birding at the bridge over the Sabie River. The tar road (H11) to Skukuza cuts through dense thorn thickets and mixed woodland. It is best done slowly because of the variety of birds and the regular occurance of speed traps. At sunset, keep a look out in the bush close to the Sabie River Bridge for Pel's Fishing-Owl. Although they are more easily seen in the Luvuvhu River valley, at least two pairs are believed to be nesting along the river at Sabie Park (just outside the reserve) near Paul Kruger Gate. Lake Panic is the major bird hide in the area. It is close to the Skukuza nursery and staff village just off the H11. Its name is apparently derived from the fact that shortly after the dam was built to provide emergency water for Skukuza Camp, it was nearly washed away by torrential downpours, creating panic at Skukuza. There's usually a crocodile lurking in the water feeding on the overweight barbel that seem to do so well out of visitors' tidbits at the hide. Kingfishers abound at Lake Panic in summer, particularly the Giant, Pied, Brown-hooded, Malachite and Woodland varieties. There are also herons, African Darters, White-breasted and Reed Cormorants, and Wire-tailed Swallows, while Black-winged Stilts, Southern Red Bishops and Thick-billed Weavers can be seen. The Thick-billed Weaver occurs in small flocks that migrate seasonally within Kruger from more open grasslands during summer to woodland fringes in winter. It appears to be extending its range beyond Kruger, moving up the Olifants River into the highveld where it is now occasionally seen in Gauteng. Among the less common Kruger birds recorded at Lake Panic are the Osprey, Black-crowned Night-Heron and Black Crake. Lake Panic is one of the few places in Kruger where the African Rail has been seen. The Skukuza Nursery has been transformed into an excellent birding spot by the construction in 2006 of a wooden walkway through the reed beds and dense woodland around the site. Located near Lake Panic and the Skukuza staff village just off the H11, it sells a good variety of indigenous lowveld plants. Co-author Lou Arthur listed 104 bird species here (including Lake Panic) during a day's work as an honorary ranger. The nursery is particularly good for sunbirds - the Scarlet-chested, Marico, White-bellied and Collared Sunbirds come to feed off the nectar in succulents and aloes. Birds and birdies don't mix, so to speak. Nonetheless, the bush around the golf course is alive with woodland birds that are attracted by easy insect pickings on the fairways and greens. One regular around the Skukuza Golf Course is the Hadeda Ibis, which struts around the greens pecking in the holes for crickets. Because Hadedas are sociable birds, they have acquired a reputation for making good relationship-binding muthi. Golfers may reflect on the fact that traditional healers grind the bones of the Hadeda Ibis (uThekwene in Zulu, Xikohlwa hi jambo in Shangaan) to make up a potion that will stop one's partner from running off with somebody else. The Yellow-fronted Tinkerbird* appears to be colonising the Skukuza habitat. Ian Whyte notes that when he moved to Skukuza in 1970, they were rarely seen. Since then they have become increasingly common, foraging around in the upper tree canopy like little woodpeckers. Many African herdboys are respectful of the wagtail - traditionally they were taught that to kill a wagtail would lead to the death of all communal cattle and to eat a wagtail was a surefire means of ensuring one would never have cattle of one's own. It was also seen as representing a wizard because of its use of human hair in making its nests. 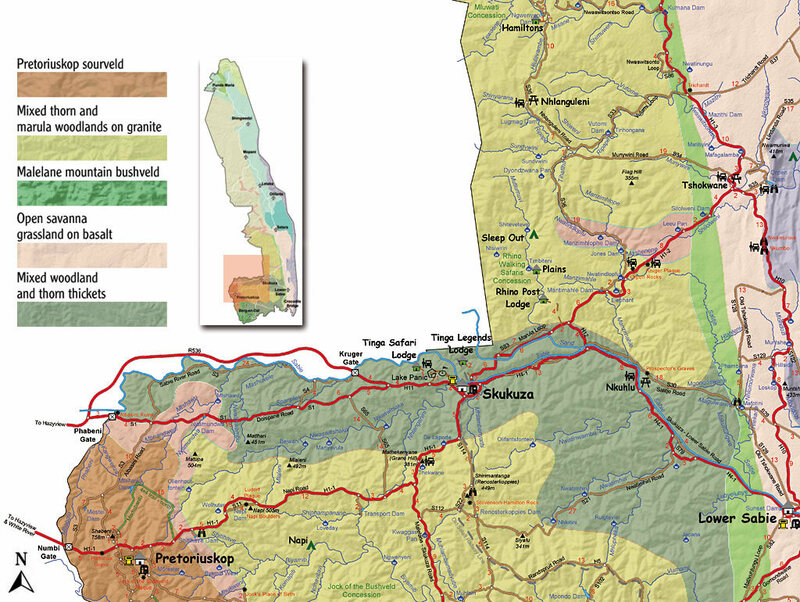 A good early morning or late afternoon drive is the loop road (H4-1, left over the Sabie River into the H12 and back along the H1-2) east of Skukuza taking in the Sabie and Sand Rivers. The 35km drive takes one through the alluvial floodplains of a major river system that provides reliable water even in the driest of winters. There are large trees lining the watercourses - Marulas, Matumis, Weeping Boer-beans, Ebony Jackal-berries and Knob-thorn Acacias, all of which are important food sources for the many birds in this area. In the reed beds along the Sabie, look out for the Thick-billed Weaver, Red-billed Firefinch, Bronze Mannikin and the musical Red-faced Cisticola. This drive offers one of the best chances of seeing lion in Kruger as there is always prey along the river. The area is particularly favoured by the Little Sparrowhawk. There are several lookout points along this drive. One of the best is at Mutlumuvi looking over the reed beds against a dense riverine forest backdrop. Look out for the Black Cuckooshrike along the Sand River and Blacksmith Lapwing* along the Sabie. The sheer number of animals in the Sabie Sand River catchment area means that there's a high kill rate in the bush east of Skukuza. Vultures are therefore a common feature in the skies and often bathe in the Sand River after gorging on a carcass. Bateleurs fly low over these floodplains and are often the first scavenging raptors at a kill. Other commonly seen birds of prey in the area are the Martial, Wahlberg's and Tawny Eagles. Wahlberg's Eagle is most easily recognised in flight by its narrow, square tail. It was named in honour of the Swedish collector, Dr Johan Wahlberg who met an untimely death at the age of 46 when he was gored by a wounded elephant during an expedition in Namibia. Wahlberg identified several species of birds during his extensive travels along the eastern seaboard, lowveld and western interior of the subcontinent. The roosting sites of Marabou Storks are evident in the dead trees in this woodland - the branches are streaked white from their faeces. Another commonly seen bird here is the Black-headed Oriole, which uses buffalo dung to cement its nest. This characteristic gave rise to its Shangaan name, Phamanyarhi (Phama - dung; nyarhi - buffalo). There are many game trails that cross the road so it's best to drive very slowly as there is always the prospect of good sightings. An interesting birding loop south of Skukuza is to take the H1-1 towards Malelane and then cut back along the S112 and S114. This allows a visit to Mathekanyane and Renosterkoppies. These low, rolling hills are a favourite haunt of the klipspringer. A common Kruger bird often seen in this area is the Southern White-crowned Shrike. Mathekanyane, accessed off the H1-1, provides fine views over the whole of southern Kruger, from the escarpment in the west to the foothills around Berg-en-Dal in the south and the low Lebombo range in the east. Shirimantanga Koppie is where the ashes of Kruger pioneer James Stevenson Hamilton and his wife, Hilda, were scattered (see The Central-South Road to Skukuza and Malelane to Berg-en-Dal). The common Dusky Lark, is sometimes seen in the grassland around the koppies. It usually occurs in small groups in the drier areas of the Park in both bushwillow and Mopane habitats, and can be distinguished from other larks in that it often flushes insects by flicking its wings. The Striped Pipit and White-throated Robin-Chat* are also regulars around Shirimantanga. See Afsaal to Skukuza and Shirimantanga. A long detour to either Lower Sabie or Skukuza can be taken via the N'watimhiri Road that follows a gently winding stream of the same name through the woodlands to the Sabie River. Siyalu Hill is reputed to be good for owls in the late afternoon, while the small pan on this road is a haunt of Lesser Moorhen in summers of high rainfall. The N'watimihiri causeway - where the river meets the Sabie - is one of the few places in southern Kruger to see the White-crowned Lapwing*, one of South Africa's near-threatened species. There are only an estimated 90 pairs in Kruger, and they are best seen on river sandbanks where they eat beetles, wasps and other insects. They lay their eggs in scrapes in the sand, often using an old elephant footprint as a nest, and will make a point of alerting bigger animals as to where their nests are so that their eggs don't get trampled. The White-crowned Lapwing* will vigorously defend its territory against competitors like the Three-banded Plover and raptors such as the African Fish-Eagle and Bateleur. The N'waswitshaka Road (S65) between the Doispane and Napi Roads is often good for a surprise or two. The 13km dust road dips through the beautifully wooded N'waswitshaka watercourse catchment, which in turn feeds into the Sabie. Palm trees like the Phoenix reclinata on this road do not occur west of here (except for a few specimens at Phabeni creek), and the drainage lines have the typical, eastern riverine trees such as Apple-leaf, Natal-mahogany and Ebony Jackal-berries, mixed with some terminalia, which is more characteristic of the west. The Woodland Kingfisher is busy here in summer while flocks of Green Wood-Hoopoes* are conspicuous in their noisy flight from tree to tree. Green Wood-Hoopoes* have a highly effective way of scaring off predators. If threatened in their communal nests, they turn their backs on their attackers and release a hideous brown liquid from their preen glands - the pungent smell is repulsive to mammals and reptiles. There are many Spectacled Weaver nests in the trees alongside the road. These yellow birds can be identified by their sharp black bills and black eye stripe which set them apart from other weavers. They are agile foragers, found singly or in pairs in the bush, and are often seen around Paperbark Acacias (Acacia sieberiana), which are usually full of insects. There may be some evidence that weavers are increasingly making their nest openings smaller in response to brood parasitism by cuckoos. In the grass on the edge of the road, look out for Crested Francolin, Swainson's Spurfowl* and Double-banded Sandgrouse. Many of Kruger's bigger raptors, such as the Lesser Spotted Eagle and Tawny Eagle often soar overhead. The N'waswitshaka road is a road of high science. There is a research tower at Sihehleni Koppie (388m) which is part of an international initiative to understand global warming and climate change. See if you can spot the NASA wind monitor among the rocks. This is often a good road for cheetah and klipspringer. Transport Dam (so named because of funds donated by the former Department of Transport) sits in the mixed woodlands at the head of the Biyamiti catchment area in the Shiphambanana Creek. It marks the point where the western sourveld meets the eastern sweetveld and is usually a reliable animal-spotting water hole, particularly for lion. There are often smaller raptors like the Shikra* looking to feed on doves in the woodlands around Transport Dam. Be aware that the road extends for a short distance past the dam and there is often good birding in the bush beyond the actual water hole. Cuckoos, and some other bird species, are nature's bad mothers - not only are they secretive and promiscuous, but they let other parents do all the work for them. In a phenomenon known as 'brood parasitism', cuckoos lay their eggs in the nests of other birds. Female cuckoos are cunning in that they hang about the nests of their potential hosts, waiting for them to fly off for food. They then pop in, lay the egg, sometimes eating one of the host's eggs, and then depart. When the foster parents fly back, they incubate the egg as if it was their own, despite any size or colour differences. To make matters worse, when the cuckoo chick hatches, it attempts to throw out everything else in the nest, including the foster parents' own eggs or nestlings. Tiny cuckoos are equipped for this 'eviction' role by having a flat back, strong feet and stiff wing stubs. An intriguing aspect of brood parasitism is how not just any foster parent will do. Although a cuckoo can have up to 20 desired hosts, they are quite specific about which birds' nests to lay their eggs in. The Black Cuckoo parasitises the Boubou, Southern Black Flycatcher and Crimson-breasted Shrikes, while Diderick Cuckoo chooses the Southern Masked-Weaver, Southern Red Bishop and other weavers. The Jacobin Cuckoo uses the African Paradise-Flycatcher, while the African Cuckoo parasitises the Fork-tailed Drongo. Other birds that make use of foster parents include the honeyguides, whydahs, Cuckoo Finch and indigobirds*.